The 11th seed in the inaugural Ultimate NHL Playoff, the ’96-’97 New Jersey Devils. This was a bit surprising. I was expected a different team to represent the Devils, but this team is very good. In typical Devils fashion, this team didn’t allow many goals, but they didn’t score many goals. They won a battle of the goaltenders in their first series, but got out-dueled in a goaltending battle the very next round. Under legendary coach Jacques Lemaire, the ’96-’97 New Jersey Devils posted a record of 45-23-14, which was good for 104 points and 1st in the Atlantic Division. They were ranked 16th out of 26 teams in goals scored (231) and 1st, of course, in the league in goals allowed (182). Hockey Reference’s SRS rating system has the Devils as the 5th best team of the ’96-’97 season despite having the 23rd weakest strength of schedule. In the Conference Quarterfinals, the Devils defeated the Montreal Canadiens in five games. However, they lost to their bitter rivals, the New York Rangers, in the Conference Semifinals in five games. John MacLean and Bill Guerin were the team leaders in goals with 29 and Dave Andreychuk was second with 27. 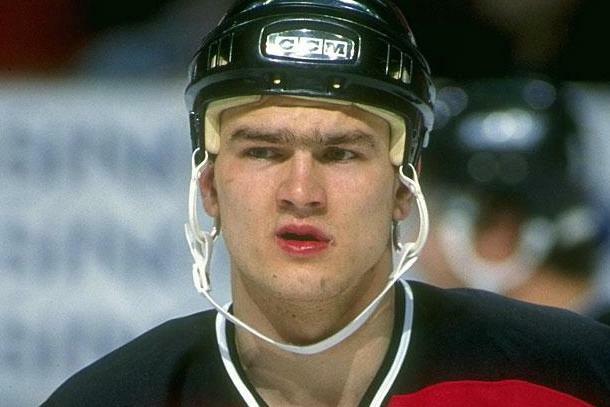 Bobby ‘Unibrow’ Holik lead the team in assists with 39 and, yet again, Andreychuk was second with 34. Holik (62) and Andreychuk (61) were also first and second, respectively, in points. This team was known for some very physical, nasty defensemen, like Lyle Odelein, Scott Stevens and Ken Daneyko. Odelein led the team in PIM’s with 110 and Stevens posted 70 PIM’s to go along with his 24 points. Andreychuk, Stevens, Daneyko and Holik were the top four plus/minus ratings on the team. Of course, this team would be nothing without their goaltender, the great Martin Brodeur. He made 67 appearances during the regular season and posted a 1.88 goals against average and a .927 save percentage. He posted even better numbers during their postseason run with a 1.73 GAA and a .929 SV%. Up next is the #12 seed, the ’95-’96 Colorado Avalanche! This entry was posted in Offseason, Ultimate NHL Playoff and tagged Bill Guerin, Bobby Holik, Brian Rolston, Dave Andreychuk, Denis Pederson, Doug Gilmour, Jacques Lemaire, Jay Pandolfo, John MacLean, Ken Daneyko, Lyle Odelein, Martin Brodeur, Mike Peluso, New Jersey Devils, Offseason, Randy McKay, Reid Simpson, Scott Niedermayer, Scott Stevens, Shawn Chambers, Steve Sullivan, Steve Thomas, Ultimate NHL Playoff, Valeri Zelepukin. Bookmark the permalink.